Prohibition Agents Walter Gilbert, John Wilson and Oliver Cetteland had arranged to make an undercover purchase of illicit liquor from George Adams in Fort Wayne, IN. Adams, a convicted felon, was on recent parole from prison for a previous Federal liquor violation. Agents Wilson and Gilbert were accompanied by additional agents in separate automobiles. They proceeded to the agreed upon meeting location, on the lower Huntington Road near Waynesdale, in Allen County. At the meeting site, Agent Wilson approached Adams' vehicle to consummate the purchase of liquor, but Adams apparently became suspicious and drew a .45 caliber pistol and threatened to kill him. Agent Gilbert, fearing for Wilson's safety, fired several shots through Adams' windshield slightly wounding him. Adams returned fire killing Agent Wilson. 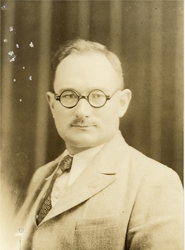 More gunfire was exchanged, during which Agent Gilbert was also shot and badly wounded. Adams wounded two other agents before making his escape. Agent Gilbert was rushed to Lutheran Hospital, but died that evening. Adams was captured by agents and police the following day. 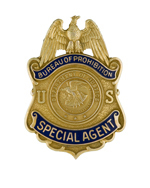 Agent Gilbert joined the Bureau of Prohibition on April 27, 1929, with an annual salary of $2,600. He carried badge #88. Agent Gilbert was born in Los Angeles, CA. He was survived by his wife, Minnie and their three children, including a daughter, Mary.